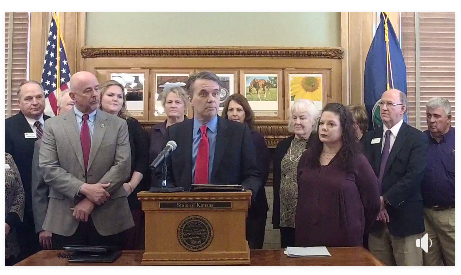 Kansas Governor Jeff Colyer Tuesday issued drought declarations for the entire state. The declaration includes all 105 counties either in an emergency, warning or watch status. The drought declaration placed 28 counties in emergency status, 29 into a warning status and 48 into a watch status. This action was recommended by Tracy Streeter, Director of the Kansas Water Office and Chair of the Governor’s Drought Response Team. Over the past six months the state-wide average precipitation was only 66 percent of normal and in January and February the state-wide average precipitation was even less, at 43 percent of normal. Counties who are in emergency stage are eligible for emergency use of water from certain state fishing lakes due to the Kansas Water Office (KWO) Memorandum of Understanding (MOU) with the Kansas Department of Wildlife Parks and Tourism (KDWPT). WATCH: Gov. Colyer issues drought declaration for all 105 Kansas counties.